You probably have never heard that there are over thousands of nerve endings in your feet. 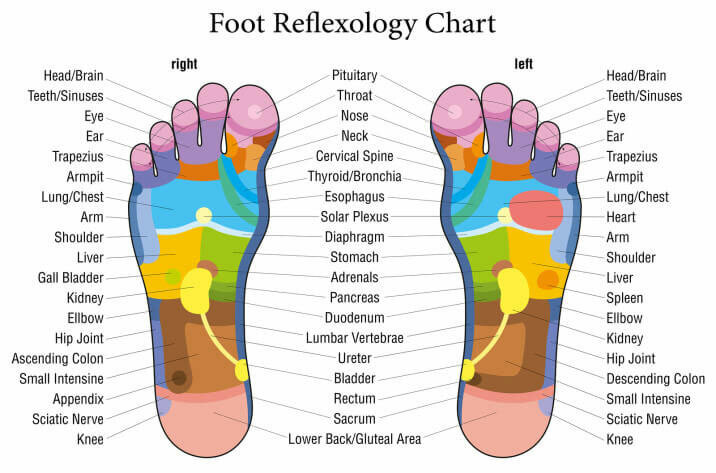 And by simple massage on specific points of your feet (technique that is called foot reflexology massage) you will relax and improve your body function. These points are related with the hypothalamus, the thyroid and other organs. You will need to massage your feet with your big finger and index finger for several minutes, and you will feel the results. This procedure (foot reflexology massage) will make you feel better and relaxed. If you are overweight, affect the hypothalamus by massaging your big toe. Applying pressure on this point will regulate your appetite. If you are having some hormone imbalances (pituitary gland), you will need to massage the center of your big thumb. The big toe area is connected with your thyroid gland. The thyroid is in charge or balancing your metabolism and if you massage this area it will be very useful, particularly if you are suffering from some stress. Ease the stress and tension by applying pressure on the center of your foot, which is linked with the diaphragm. In order to boost your energy massage the inner edge of your foot closer to the center, this will act on your adrenal gland. The adrenal glands are maintaining your energy levels to burn more calories. If you massage your feet in the areas near the fifth, you will stimulate the excretory system and relieve the excess fluids in your body, which means that the toxins will be ejected. Massaging the bottom of your foot will affect your colon and intestines and you will boost elimination and reduce bloating. These massages are very useful after hard day at work or exhausting activities. Once you feel the benefits from these massages, and they will become your habit. Health Benefits of Maca Root – Balances the Hormones, Boosts Fertility, Improves the Hair And Skin Health!